An Australian journalist was asked to leave the premises of the parliament because because her outfit was too revealing in that “you can allegedly see too much skin”. I naturally had to click on the article to see what scandalous clothing had prompted this decision. See-through blouse? Plunging neckline? Very short skirt? 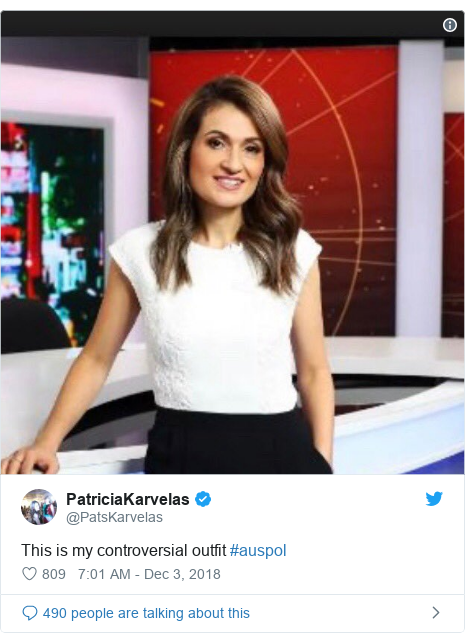 Here is a photograph of Patricia Karvelas in her offending outfit. That’s it? So what exactly was the problem? Apparently the sleeves were too short. Yes indeedy, the sight of a woman’s upper arms may distract male MPs and even cause some to swoon. This is even more ridiculous than the ban on ‘nighties’ in an Indian town. As critics have pointed out, Australia has had a female prime minister Julia Bishop MP Julie Bishop who has worn sleeveless dresses to parliament without any problem. But that is not the point. The real problem is the strict policing of women’s clothing and the purely arbitrary decisions, almost always made exclusively by men, about what they can and cannot wear in public. The late, great comedian and raconteur Dave Allen had a nice bit about this obsession with women having to cover certain parts of themselves and traces it back to the Genesis story. I know we change Prime Ministers so often I can forgive the error. We had a female PM, Julia Gillard, and a female Deputy PM, Julie Bishop, the former from thje Left, the latter of the right. Gillard faced much criticism, particularly because a) She co-habited with her partner rather than being married and b) Because she is a Woman , how can she not have children? Bishop was renowned for her bright red stilletos, thus making her “True Woman”. Thanks for pointing out that error. I have corrected it. The Australian Parliament is now demanding women wear burkas? I often get the impression that some Australian male MPs (LNP?) may be even nuttier than our Conservative MPs but this is madness. Heck, I have seen women in Saudi Arabia wearing about the same outfit that Ms Karvelas is wearing. @ Marus -- our PM is a member of Horizon Church, a descendant of AOG, so you are spot on there. He is intent on leading us down the rabbit hole that is today’s GOP, ensuring that religious freedom means the freedom to bully those not of your faith. OK, let me take this from a different direction. Does the floor of parliament allow men to show up in T-shirts (with similar coverage)? In business situations it seems that women are almost always allowed to show up showing more skin, like a V-neck, than men. How many men are allowed to go to work in a business situation with their calves exposed? ahcuah, how do you think women showing up in suits and ties are viewed in general? How often do you hear the word “pantsuit” used without a whiff of disparagement? Tabby, nice job changing the subject (which was the showing of skin). And I completely grant you how ridiculous the disparity is on what is considered “acceptable” for men and women. But I bet a woman showing up in a suit and tie will be treated better than a man showing up in a dress, or skirt/suitcoat combo. And that’s true even if the man calls it a “kilt”. Gender norms for the win. Re: pantsuit. A lot less these days than before. All that said, yes, I do think it stupid that the woman got in trouble for that blouse. And it is stupid that the culture seems to think (as far as I can tell) that women need to show more skin, but not too much skin. But I was mainly trying to point out that the culture is pretty stupid in general. I bet a woman showing up in a suit and tie will be treated better than a man showing up in a dress, or skirt/suitcoat combo. And that’s true even if the man calls it a “kilt”. I may depend on where you live. I have seldom seen a man show up to work in a kilt but it is not unknown for the occasional expat Scotsman to show up in a kilt at formal occasions. And of course our Highland regiments’ dress uniforms have the kilt. This is the inevitable result of Australia’s strict gun laws. In the name of public safety reporters have lost the right to bare arms.